The Belfast Giants completed a winning weekend by beating Edinburgh Capitals 6-3 in Sunday's Elite League encounter. Goals from Lukas Bohunicky and Dennis Rix put Edinburgh 2-0 up before Ray Sawada pulled a goal back. 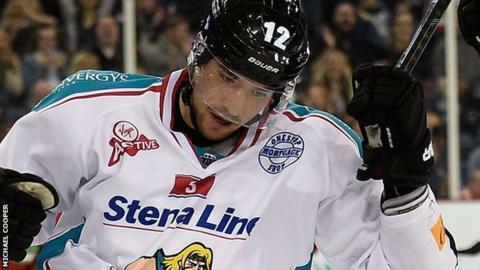 Mike Kompon levelled early in the second period before goals from Calvin Elfring and Adam Keefe put Belfast in charge at Murrayfield Ice Rink. After Greg Collins cut Belfast's lead, Mark McCutcheon and Darryl Lloyd netted for the visitors in the final period. Lloyd's late strike was an empty-net goal as the Capitals went for broke in the closing stages. Giants netminder Carsen Chubak again made several crucial saves in Sunday's contest after producing an outstanding display in Saturday's penalty shootout win in Sheffield. Following four straight defeats, Belfast edged out the Steelers as Kompon was the only player to net in the shootout after the 60 minutes of regulation play and over-time had failed to produce a goal.